After 12 year of drought Victoria is celebrating the rain, despite the flooding. This is the landscape that overlooks my daughter’s school. it is a magical place whatever the season. I am 2,000 km from here now, visiting Byron Bay. My heart calls me to the ocean and the warmth of the Northern Rivers, and I still plan to move up this way, but I also love the Yarra Valley. Australia is an extraordinarily beautiful and diverse country. As someone pointed out to me recently only around 0.3% of the people on earth get to live here. We are so fortunate! What a beautiful way to begin my day – with a rainbow! thank you. Great shot! Oh, such beauty, and the rainbow is an added treat! Yes, you are lucky to live where you do! Thanks Kate. I do love it. Next post will be of the Northern Rivers which are beautiful in a very different way. It is particular poignant timing to be reminded both of our fortune, and of flooding, having just finished watching a harrowing Four Corners episode on the devastating floods in Pakistan…..
so true Ruby, the floods in Pakistan are an entirely different kettle of fish – mind boggling! You found it! The end of the rainbow!!!! Beautiful, Kirsty and there are horses there. 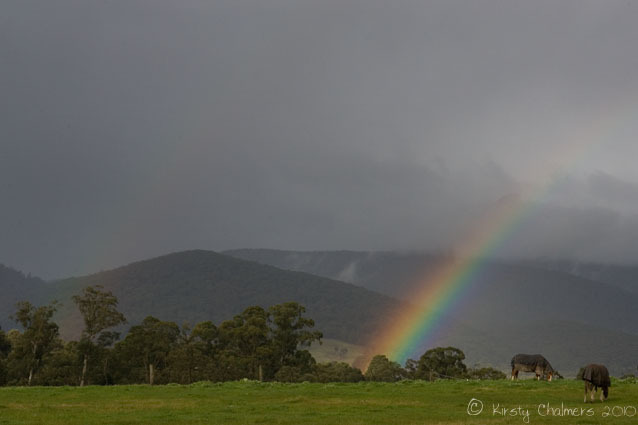 Am a longtime horse nut, so this truly would be the pot of gold at the end, for me to find horses there. Made my day! Blessed indeed. This makes me smile. You’re doing a grand job of recuriting me! What a lovely landscape. lol this was certainly a special moment. Then again Eva, everywhere is special if we look at it with loving eyes isn’t it? Yes, our attitude and perspective towards a place is what makes anywhere special, Kirsty.